ALKMAAR- AZ has ended a proper season in style by overmastering PEC Zwolle: 6-0. 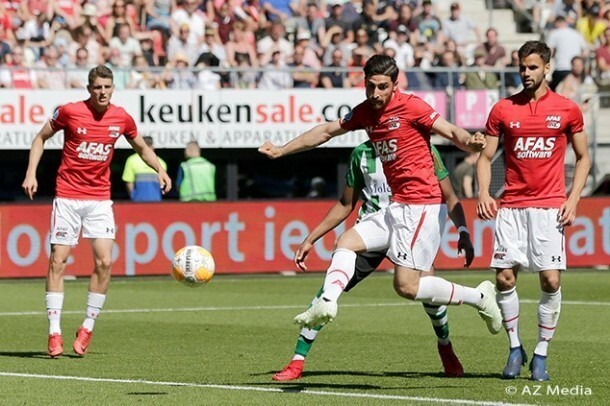 An unchained Alireza Jahanbakhsh took AZ by the hand with a hattrick, and therefore crowned himself as top scorer of the Eredivisie with 21 goals. AZ had two potential contestants in the ranks: Alireza Jahanbakhsh who started the match with eighteen goals, and his attacking partner-in-crime Wout Weghorst who had sixteen goals in his account. PEC Zwolle, on the other hand, still had to fight for the European play-off tickets but that wasn’t really visible. The Zwolle defence was a playball for AZ that only produced one goal in the first 45 minutes, a strike from distance from Jahanbakhsh. The second half was one of the most spectacular showcases by AZ this season. Both Weghorst and Jahanbakhsh managed to score twice, leading the Iranian international to be the Eredivisie top scorer. AZ ends the season on the third place. Line-up AZ: Marco Bizot; Jonas Svensson, Rens van Eijden (75. Mees Hoedemakers), Pantelis Hatzidiakos, Owen Wijndal; Fredrik Midtsjø (85. Tijjani Reijnders), Guus Til, Teun Koopmeiners; Alireza Jahanbakhsh, Wout Weghorst, Mats Seuntjens (67. Myron Boadu). Line-up PEC Zwolle: Diederik Boer; Kingsley Ehizibue, Sepp van den Berg (46. Terell Ondaan), Dirk Marcellis, Nicolás Freire, Bram van Polen; Rick Dekker (70. Erik Israelsson), Philippe Sandler, Queensy Menig, Mustafa Saymak; Youness Mokhtar (61. Shaquile Woudstra). Goals: 13. Jahanbakhsh 1-0, 52. Jahanbakhsh 2-0, 63. Midtsjø 3-0, 76. Weghorst 4-0, 77. Weghorst 5-0, 88. Jahanbakhsh 6-0.